SS07, Audio or MIDI interface for tablet/iDevice from Optivelox. Optivelox presents SS07, an audio-to-USB converter + stereo mic that allows you to make quality recordings on Android smartphones & tablets. Let's face it: smartphones are generally not that good at audio. Their internal mics are tiny and have a limited bandwidth, as for good external microphones, they may suffer from poor performance mainly due to the filters and noise gates placed in the signal path, plus most of them only support mono recording - not stereo. You wouldn't keep your arm raised during this whole goddam' rock concert for a video with a mere mono signal would you? In an attempt to address this kind of issues, Italian company Optivelox has developed SS07, a USB adapter able to capture sounds from analog sources and convert them into a digital stream up to 24-bit/192kHz. To complement it, Optivelox has also developed UARecorder, an app for Android devices that fully supports SS07 to record files in WAV format from the interface's digitized signal. Hence, the quality of the input analog circuitry of a smartphone is not longer an issue as the phone deals with digital signals only. Although the SS07 was designed to operate with a wide range of input sources (not only microphones but also other analog audio sources like electric guitars, keyboards or synthesizers), its creators also designed a particular mic head aimed at being a natural companion of SS07. More precisely, they are planning to release a total two different mic heads, both equipped with a couple of hi-fi, low noise microphones - with the MIC2 being intended for general purpose applications, and the MIC3 which is meant to allow for higher SPL values. 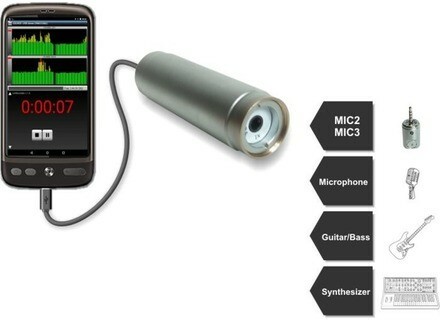 According to Optivelox, the MIC3 might be needed for very loud sound recordings, e.g. if the mic is placed close to high power loudspeakers. As is more and more often the case, Optivelox has opted for a Kickstarter campaign to support this project. For the next 29 days, a total one hundred SS07 units are available for €59 instead of €99, another hundred kits including the SS07 and MIC2 are available for €93 (a €158 future retail value) while 100 kits including the SS07 and MIC3 are available for €99 instead of €168. Finally, the most complete kit of all includes the SS07, MIC2 and MIC3, and 100 of these kits are available for €139 instead of €227. Other offers are also available for less early birds - with a lesser discount too, but still a better price than the planned retail value. More details at the Kickstarter project's page and at Optivelox's website. Acustica Audio's Amethyst available for pre-order Acustica Audio has announced that its next channel strip emulation, Amethyst, can now be pre-ordered at a special price. Version 7 of Tracktion now available The Tracktion Software Corporation has released T7, the latest version of their DAW. Garritan's Personal Orchestra 5 now available Garritan has now released Personal Orchestra 5, the latest volume in their flagship series that was unveiled some weeks ago at the NAMM.